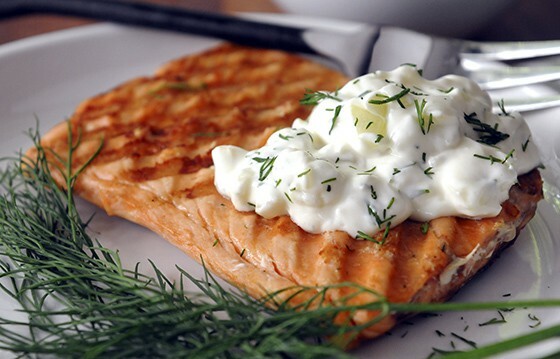 Greek Yogurt and Cucumber Sauce for Fish is a simple, no-cook sauce containing Greek yogurt, cucumbers and seasoned with dill. Serve alongside grilled or pan-fried fish. Also excellent with any kind of seafood patties. In case you’re wondering, this simple sauce is most likely a close relative of Greek tzatziki sauce, but we’ve never called it that. Probably because we weren’t sure how to say it or spell the word. This recipe for Greek Yogurt and Cucumber Sauce for Fish was adapted from a rather old book, Best Recipes From the Backs of Boxes, Bottles, Cans and Jars by Ceil Dyer. I use to serve it with salmon loaf made from canned salmon, but since I rarely use canned salmon anymore, it has become one of my favorite accompaniments for grilled salmon. Speaking of grilled salmon, we love the fresh salmon sold at Costco. Have you tried it? Tastes so fresh and is delicious straight off the grill with a simple condiment. Due to only two of us at my dinner table normally, and Costco only selling the fresh salmon in large pieces, the leftovers have motivated me to expand my “salmon-leftovers” library, which is a good thing. If you also need to expand your seafood library, my 3 favorite recipes on this blog are: Almond Salmon, Pizza Fish (great for the kids), and pan-fried tilapia with Spicy Cowboy Sparkle Dust. Greek Yogurt and Cucumber Sauce for Fish now makes the fourth. No cooking required. Chop, stir and serve. I’ve been making this condiment/sauce for years with sour cream. 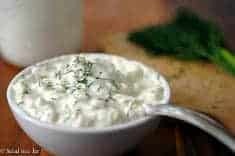 But now that I have homemade Greek yogurt in my fridge at all times, I substitute Greek yogurt for sour cream. Tastes even better. Combine all ingredients and serve with fish. Reserve a pinch of dill for garnish. what are the calories for this yogurt cucumber dip? If you get 4 servings per recipe, it’s about 90 calories per serving, although that can vary depending on the brand of mayonnaise and yogurt you use. I also noticed the recipe was not quite right (all ingredients listed twice) as the result of a recent site-wide recipe conversion process. Glad you indirectly brought my attention to it. So simple and delicious – love this kind of preparation. I love, love cucumbers but I dislike dill. Can we still be friends? Do you think I could use chives or something and it would still be acceptable? Sometimes you make me cry, sometimes you make me cringe, but most of the time you just make me laugh, like today. You are so talented my friend. Have you started on your autobiography? Can’t imagine why chives wouldn’t work. Honestly, I’m not huge on dill and I really dislike cucumbers but for some reason, I like this stuff. Go figure. My husband loves fish, can’t get enough of it. He’d very much enjoy this yogurt & cucumber sauce I’m sure. ok, nevermind….it appears that you already have a “dips & dressings” category. yep, looks like a good condiment for the “condiment” family! maybe you need a post on your favorite condiments? or possibly a whole food category just called “condiments.” there would definitely be a lot! We eat a lot of fresh fish. My daughter’s boyfriend owns a sports fishing boat and I’m always willing to take any extra the catch of the day. Having sauces to dress up fish is a great way to liven things up. Sounds delicious! I will try that this week! I have to agree with you on fish consumption for myself, just didn’t get brought up eating it much. As kids I loved fishing but never ate what we caught because it was rainbow trout and it was super fishy tasting. Mom burned me out on canned tuna so don’t really ever want canned tuna. The yogurt sauce sound great I still need to get the courage to make your Greek yogurt. Sounds delish! I love fresh cukes from the garden. I just made yogurt yesterday and brought in cukes from garden so I’ll try it. Sounds like it would be good on anthing.. I love seafood but unfortunately here in Chicago, it can be expensive and our choices are often limited. This sauce would also work with lamb burgers! Sounds fresh and clean. Since I eat a lot of salmon, (I work in a grocery store, so I have easy access) I’ll certainly give this a try! I can do cucumbers far easier than I can do fish. I just don’t seem to have a taste for it. But, the cucumber sauce sounds light, bright and flavorful and a great accompaniment for salmon. I like the idea of the dill.